Circus building, built 1853-1854 for the German circus owner Ernst Jakob Renz. Opened 18 Feb 1854. 3559 seats. 1883 rebuilding by Oskar Laske. Closed 1897. Subsequently used as a warehouse. 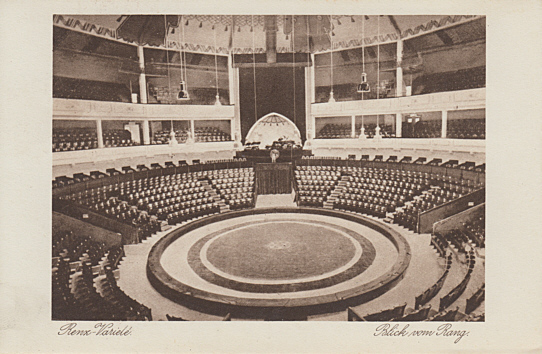 1923 renovated and re-opened, used by Circus Carl Hagenbeck. Damaged by fire in 1930. Re-opened 1930 as "Varieté Renz". 1944 severely damaged by bombs. Demolished 1956 in favour of a housing estate. Front Text: "Renz-Varieté, Blick vom Rang"
Reverse Text: "Renz-Varieté, Wien II, Zirkusgasse 44. Ueber 2000 Sitzplätze. Täglich 2 Vorstellungen: 4 und 8 Uhr. Sonn- und Feiertags 3 Vorstellungn: 2, 515 und 830 Uhr."